There are very few plainer objects in this selection, but none that is more consequential. The socalled Books of Survey and Distribution, compiled between the 1650s and 1680s, record in microcosm the seismic shift in the ownership of land in Ireland after the Cromwellian conquest. The class of Catholic proprietors, of both indigenous and Anglo-Norman descent, was all but swept away. These pages, from Book 17, show what happened in just one parish: Kilcaruan in Duleek, Co. Meath. On the left-hand page are the names of the owners of lands in 1641, when the great Catholic uprising broke out. On the right-hand page are the names of those to whom the land was given after it had been expropriated. Accompanying the pages is the hand-drawn map of Meath from the Down Survey, which was used to record the major land holdings throughout Ireland so that the project of expropriation could be conducted properly. Thus, we can see that most of the land in Kilcaruan was held in 1641 by what would then have been called Old English families—descendants of much earlier post-Norman settlers: Plunkett, Luttrell, Moore, Talbot, Allen. After 1641 these ethnic distinctions have been sunk in the crude code written after their names in the book: ‘Ir. Pa.’—Irish papist. That in itself justifies the transfer of their lands to Protestant ownership overwhelmingly to the earl of Anglesey. In each case the number of acres held in 1641 is the same as the number transferred—the expropriation was wholesale. After the defeat of the Catholic rebellion, the Commonwealth administration undertook an extraordinarily ambitious programme of social engineering. Under the guise of the punishment of traitors, about half of all land in Ireland was taken from its owners and given to adventurers who had funded Cromwell’s armies or to those who had served in his campaigns. The policy was modified but continued after the collapse of the Commonwealth and the restoration of the monarchy. The scale of change was remarkable: the amount of land in Protestant hands went from 41 per cent of the total to 78 per cent in just 20 years. 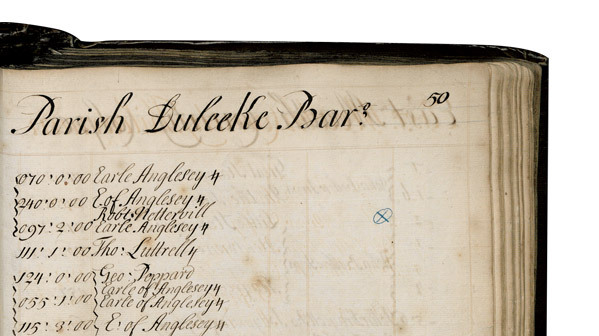 It is not surprising that the names on the lefthand page feature heavily on the Jacobite side of the wars of the 1680s. A later Simon Luttrell, for example, was a prominent Jacobite cavalry commander and afterwards a colonel in the service of the Spanish monarchy. The new owner of the lands in Kilcaruan, on the other hand, was himself Irish. The earl of Anglesey was born plain Arthur Annesley on Fishamble Street in Dublin; his father was secretary of state for Ireland under Cromwell’s son Henry. Arthur supported the parliamentary side during the civil war, but he then became a key figure in the restoration of the monarchy under Charles II, being rewarded with an earldom and the lucrative position of vice treasurer and receiver general of Ireland from 1660 to 1667. He embodies, indeed, the great irony of the seventeenth-century land settlement: it was initiated by rebels against the crown but created a loyalist ruling class.